Topical cards touch upon current events and themes in this contemporary life of ours. This category includes celebrity ecards and political ecards and the general mish-mash of things you’ll read about in the news. When giant robots attack major cities, for instance, you’ll soon find a topical card here touching on the fact and probably blaming aliens. People are always talking about their right to own a gun; they never talk about MY right to own a gun. If I owned a gun I'd be shooting it all the time. Double-parked cars. The occasional jet ski. This bus driver who closed the door as I was about to get on, who I chased for two miles on foot. The real reason I shouldn't have a gun is how much I want one. And also how much I want a bazooka. As a man I've always considered myself a feminist, I think it's because women look really nice. One of the great triumphs of feminism, I think, was getting women out of those uncomfortable shoes that made them really irritable. Do you know how many men went deaf from being screamed at by uncomfortably shod women? Two bazillion. Trust me, I'm very good with statistics. When the doctor told me about Messianic Personality Disorder I held up my finger and said 'to define is to limit'. And I thanked him for naming a disorder after me and that I would regard it as a lifetime achievement award. He then said it wasn't named after me, which I suppose means I don't have it. Psychiatry is still just a theory I guess. My Grandmother taught me everything there is to know about world religions, ie. lizards from space have infiltrated all world governments, we're part of the resistance, and all other religious beliefs are crazy. She taught me to be tolerant, and believe in all religions, except when they contradict the stuff about lizards because that's just CIA disinformation to test our faith. Hi Nanna! Romance. It can't be avoided. It has all the sad inevitability of scabies. And what is romance, anyway? On the one hand, you say you don't like someone at work but when their house burns down suddenly I'm the bad guy. And some men grow up eating crayons. Love is not about taking away a man's crayons. What is Romance? Do I put my elbows on the table anymore? No I don't. So there. These are exciting times for me. The current pope is resigning, for reasons that an internal Vatican inquiry has declared entirely unrelated to my letters, and so obviously I'm focused on my resume and cover letter right now. I'm emphasizing that I've watched every episode of The Borgias, and that hardly any Cardinals will be poisoned or blackmailed. I'm going to win this. These cards are subcategory of our topical cards selection and basically they’re only about celebrities and famous people. Ecards for people with obsessive compulsive disorder - a switch flipped on in my head - fourteen times, off and on, just to be sure - and there it was: why hadn’t we created these yet? Of course, at first I wasn’t sure this was a good idea. Why risk offending a group of people who are really well organized? Still, at least the letters of complaint would be neatly written. On the other hand I’d have to open five identical envelopes per complaint. Finally it struck me. People with OCD aren’t gonna mess with me. They’ll might come over and tidy up around me a bit, but they’d never mess with me. Note: there are three spelling errors in the above paragraph: can you find them all? They were exciting times. 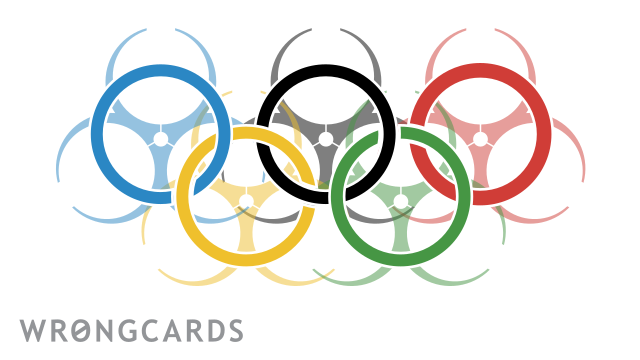 The International Olympics Committee were excited about Wrongcards agreeing to create the official ecards for the games. We were flown first-class to Geneva and taken on tours of the IOC headquarters by beautiful polyglots dressed in the latest Milan fashions. Cigars were lit, bottles of ouzo were poured into chilled decanters by prim, soundless waiters. And the olives! The olives, I don’t need to say, were perfection itself. Our hosts in Lausanne were happy. We were happy. There was talk of us taking a jet to someone’s private resort in Northern Italy later in the afternoon for a little light skiing. 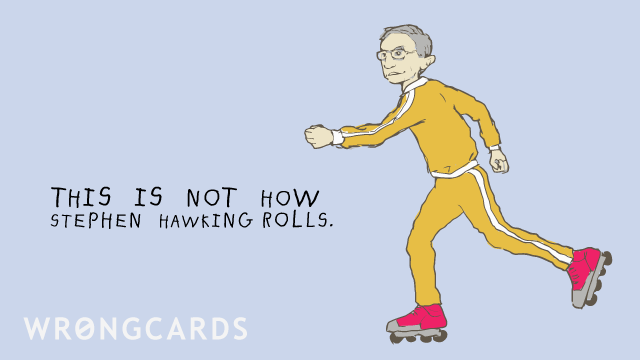 Then someone asked if we’d like to show them our drafts for the Olympic cards. Innocently, I pulled my Macbook Air from its case… Only later, amid the confusion and tension, I realized my mistake. The very air seemed to change. Someone knocked over a wine glass. Dignitaries were escorted from the room by panicked security guards and a booming baritone declaimed indignantly to me in French. God knows what THAT was about, nor how we got to the airport. If it wasn’t for our lawyers I have no idea where it all would have ended. 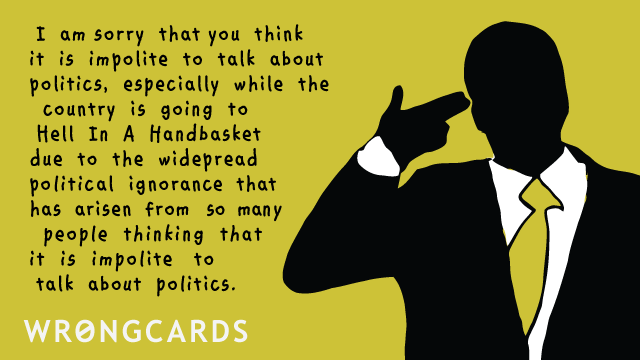 These ecards are belong to our Topical Ecard category of Wrongcards, and aim to truly capture the political zeitgeist of our times. Some of these are bound to annoy someone, but - and this is the crucial point here, when you think about it - they will only annoy people with incorrect political opinions. So nothing to worry about really. Scientology is often described by experts, actors and celebrities as the one true religion. Because only a few religions have ever claimed that mantle, we have decided they might be onto something. These cards are represented here as satire because everybody knows that the L. Ron Hubbard was no mere writer of fiction. We would ourselves be practicing Scientologists but we do not have the funds for auditing and so all spiritual progress is stymied by our lack of wealth or celebrity. 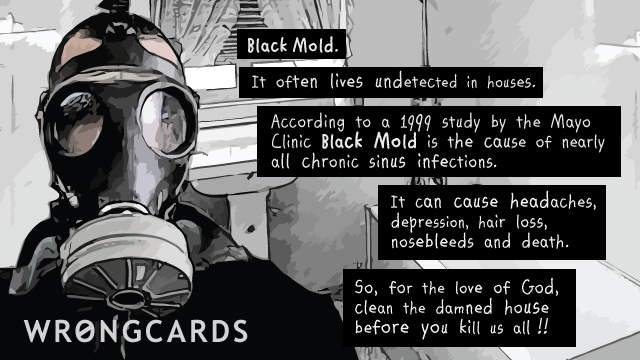 The cards here are clearly wrong and in poor taste and we include them among our collection to show you just how stupid opponents of the Church of Scientology can be. I know it sounds backwards but that’s how satire works.